The ova, or eggs, of the Luna Moth are small and dark in color, brown to almost black. They are laid singly or in small groups on the food plant and have a rough appearance. They sometimes have hairs from the moth’s abdomen attached to them as well. They usually hatch within a week to ten days. Fertile eggs remain full whereas infertile eggs will collapse upon themselves. The larva, or caterpillar, of the Luna Moth is spectacular in both coloration and size. The caterpillars go through five stages of growth, called instars, before pupating. Like all insects they must shed their skin, or molt, to grow and they do this once for each instar. Caterpillars are eating machines and each instar lasts approximately a week, depending on weather and availability of fresh food (cooler weather slows them down and lack of quality food can also stunt their growth). In the wild the caterpillars are loners, rarely eating together in the same area. This makes them more difficult to find by predators. The pupa of the Luna Moth is spun up in a papery cocoon, usually within the debris at the base of the food plant. In some instances the cocoon is spun within a leaf that is still attached to the tree. In the fall this would drop from the tree and stay protected and insulated among the dead leaves at the base of the tree. When disturbed, the pupa is very active within making a loud rattling noise as it moves its abdominal area back and forth. There are oftentimes two broods during the season, the first of which hatches mid summer. These cocoons usually hatch within two weeks. The cocoon of the second brood then goes dormant over the winter, hatching out the following spring. The cocoons usually hatch in the morning, giving the adult moth the day to pump up and dry its wings. There is no escape valve on the cocoon so the hatching adult needs to use its thoracic spurs to cut through the paper thin cocoon. The adult Luna Moth is perhaps the most stunning moth in North America. When people see one for the first time, especially if they are unaware of the species, the first thing they think is that something tropical was let loose. Being nocturnal they are rarely seen unless you are fortunate to either come across a newly hatched one that is drying its wings or one that flew to a street or porch light and remained until the next morning. Their long, elegant tails are thought to confuse bat sonar, making them less likely to become a meal. They do not have any mouth parts and must live off of stored fat from when they were a caterpillar. Adult Luna Moths only live a week to ten days, just long enough to mate and lay their eggs. The feathery antennae are used by the males to search for females for mating purposes. Since locating each other in the dark would be difficult based on sight, they use their sense of smell. When ready to mate the female moth releases a pheromone from her abdomen that the male then picks up with his very sensitive antennae. One female can draw in a dozen or more suitors, from miles away! 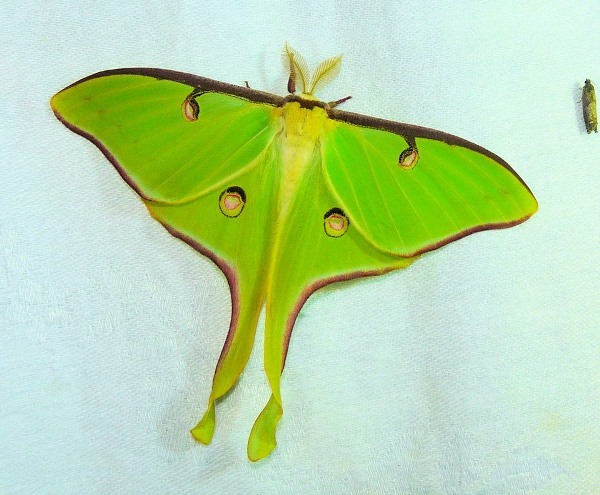 This entry was posted in Rearing moths, Saturniidae and tagged Actias luna, James P. Tuttle, Luna moth, Michael M. Collins, Paul M. Tuskes, The Wild Silk Moths of North America. Bookmark the permalink.